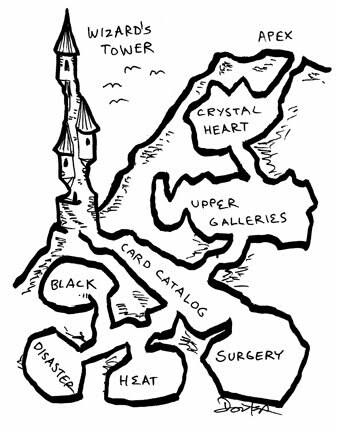 Wizards prefer to live in towers as a rule. Nobody is quite sure why this is, least of all the wizards. 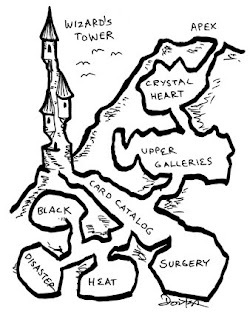 A necromancer often lives in a black tower, which might be made of corrugated iron. An ice wizard can make her tower of ice. A fire wizard's tower is visible for miles. An air wizard's tower might not be visible at all. And of course there are all sorts of wizard's who don't bother with such displays,though they are nevertheless very powerful. This wizard is a library wizard, though he also does arcane surgeries, mostly to make ends meet in this rotten economy. You might find almost anything in a Wizard's basement. You can buy prints of the Wizard's Tower on Etsy. This is a particularly good one.